How did you come up the idea for the smart bag? I’ve always been concerned about food waste which is a major problem in developed countries like the United States. As a nation, food waste costs us $165 million per year and personally it costs me $800 per year. I knew there had to be a solution and so I came up with the idea of the smart bag, a reusable, machine washable, fabric bag that is lined with a naturally occurring mineral that absorbs decay enhancing gas ultimately slowing down decaying process. The smart bag, which costs $9.99, extends the life of produce by four times and saves consumers $1,400 per year. I have a BS degree in biological sciences from UC Santa Barbara and a master’s degree in biochemistry and molecular biology from the University of Southern California, Keck School of Medicine. I have over 12 years of experience working for major pharmaceutical companies, doing discovery research in neuroscience. For the past five years, I have been the CFO of Kristjan Adler medical practice. My current job of managing a medical practice rekindled my desire to start my own business. The day I entered the hallowed halls of the Graziadio Business School as an MBA student was the day I realized that my dream of becoming an entrepreneur was coming to fruition. Why did you choose Pepperdine? Since I received my master’s degree from USC I thought it would be natural for me to go there for business school. However, when I went to an information session at the Graziadio School I saw the small student-faculty ratio and I was impressed with the hands-on participation of the professors. It was clear to me that the professors are there because they want to make a difference. I also chose Pepperdine because of the flexible class schedule that the school offers. I was able to balance the duties of work, school and the challenge of raising my 8-year-old son. Describe your entrepreneurship classes at Pepperdine. I took two of Dr. Larry Cox’s entrepreneurship classes which enable students to develop a compelling new business idea that has large market potential. As part of his class, we practiced pitching our new business idea to other students and Dr. Cox continually gave me feedback and encouraged me to keep going. On the final round, Dr. Cox brought in an outside business panel to listen to each student’s pitch. After hearing my pitch one of the people on the business panel told me that he was interested in investing in my company, which was a huge validation. Dr. Cox also connected me to a Pepperdine alum who put me in touch with a manufacturer in the U.S. I also took a finance class with Dr. John Paglia and he has been an inspiration to me. Needless to say, I’m very grateful for Dr. Paglia and Dr. Cox’s support and encouragement; they both have been instrumental in helping me get to where I am today. Where the smart bag in the development process? I have done extensive product and market research created a proof of concept and had a prototype made which I have used to do experiments. If everything goes smoothly I’m hoping that the smart bag will come to market this summer. I plan to initially sell the smart bag online and when I have generated enough revenue I will explore retail options. 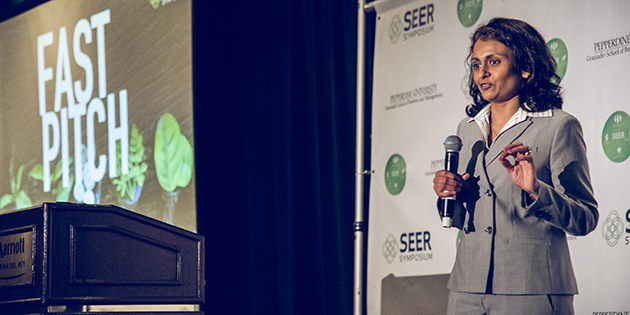 Congratulations on winning the Fast Pitch Competition at the 2017 SEER Symposium! Any insight on why you think you won? I think the idea of reducing food waste as well as my business model resonated with the panel of judges. Not only is reducing food waste good for the environment and consumers, there is a social responsibility component in which I will donate 0.5% of my sales to help local farmers and the food bank. I think this combination really embodies the SEER model and Pepperdine’s commitment to developing values-centered leaders. 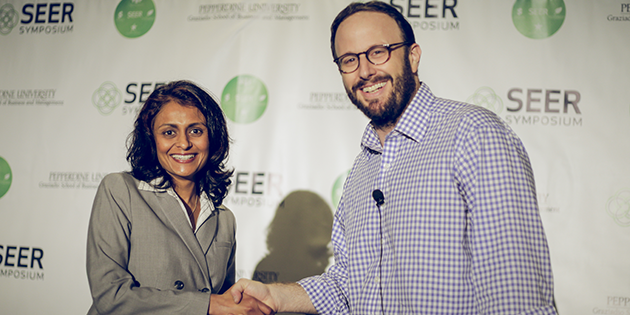 Gigi Desai is biochemist setting out to reduce the problem of food waste. She resides in Santa Clarita, CA with her husband and son and is currently working to launch the smart bag. She earned her MBA from the Pepperdine Graziadio Business School in August 2016.